I washed and blocked a whole bunch of knitting and spinning a few days ago, but will only be posting about the handspun today. In total there were 3 skeins of yarn, one stole, one scarf, the rug waiting to become a blanket, a pair of socks, and a cowl/collar thing. I don’t have any good blocking pictures, so there won’t be a post about everything, but the shawl does need to be reblocked, so there will be a post about that soon. 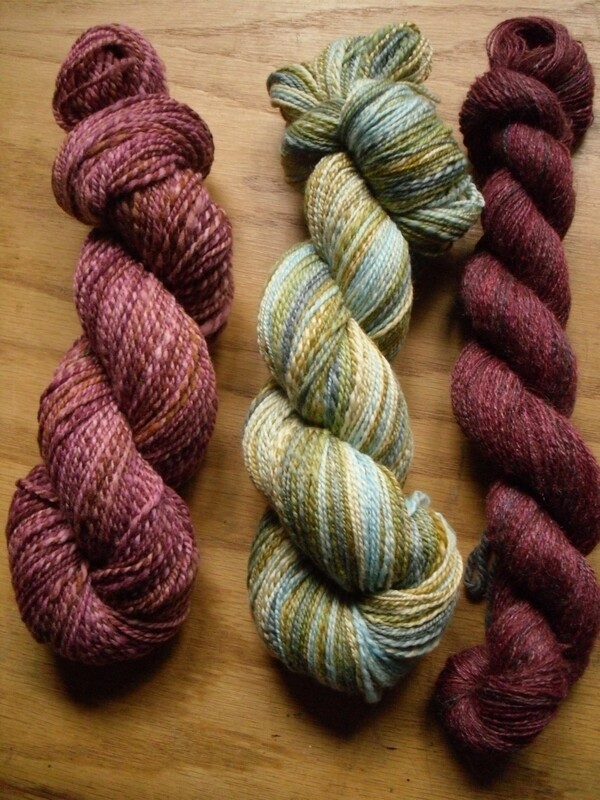 Here’s a picture of the three yarns, left to right they are Raspberries, Belle, and Rubies. Raspberries, is approximately 250 yards, 3.64oz, of 100% super-wash merino, from Zen String (now wildflower whimsy) in Raspberry Swirl, ending up at 14wpi. The fiber originally had a lot more white spots that got dyed over and blended together while the yarn was soaking. Belle has showed up in the past few posts. It is approximately 420 yards, 4.1 oz, also of 100% super-wash merino, from Yarn Love, in the colorway Belle, and ended up at 16wpi. I’m thinking of turning this into a shawlette, or maybe a scarf. Rubies was last seen in this post, when it was first finished being spun. Both Raspberries and Belle were spun and plied on the wheel, but Rubies was spindle spun and wheel plied. It’s approx 372 yards, 1.55oz, a 70/30 blend of Alpaca/Silk, from Gale’s Art, in Ruby Swirl, and an amazing 28wpi. This will probably end up being a lacy little scarf or a cowl. I’ll hopefully get the shawl reblocked, as well as some other shawls and scarves blocked soon, and I have a bunch of knitting progress to write about, so I’ll try for more regular posts.